Becwar & Associates The Entertainment/Talent Agency that knows how to Entertain. 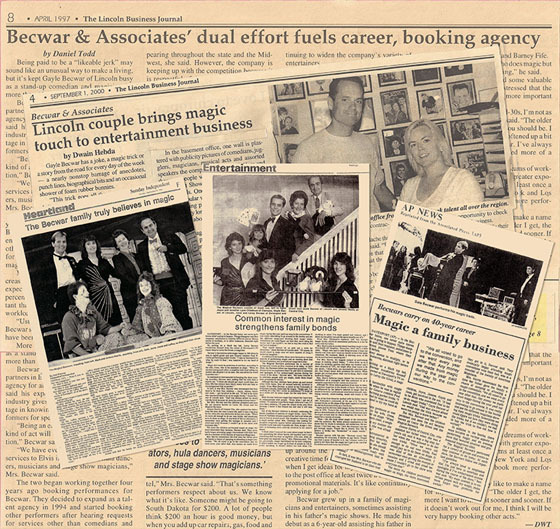 Becwar & Associates is a full-service, family-owned entertainment and talent agency based in Lincoln, Nebraska. This location has been ideal for booking thousands of local and nationally recognized performers from all over the USA. Since 1987, they have been supplying all types of entertainment, for any type of event. Whether you are looking for a Big Time Celebrity Act or Band, a National Touring Professional, or a Local Semi-Professional Performer, Becwar & Associates Entertainment Agency will share suggestions and help you find what you need. And most importantly, you get that ACT at the Best Price! Becwar & Associates Entertainment Agency is different from most talent agencies because they are entertainers. Owner, Gayle Becwar, is a Professional Comedian/Magician/Mentalist. He started entertaining with his father when he was only 5 years old. Gayle’s wife Cindy is trained in sales and entertainment management. His late Father, LeRoy, was a Professional Magician, and his Mother, Irene, was his Assistant. Gayle’s 3 sisters Joyce, Janene, and Janis, are all semi-professional Magicians and Illusionists. His Uncle Leonard was a Musician, Singer, and Band Leader (voted in the Nebraska Music Hall of Fame) and his Aunt Delores and cousin Dawn are singers. Since ALL the Becwar’s grew up as entertainers, they understand what “performers” need, and what “buyers” need. They also know what it is like for an Agent to take a hefty commission. You can be assured that Becwar & Associates Entertainment Agency will NEVER take more than 20% commission from any entertainer. This way the savings are passed on to you, and the entertainer gets his fair price. Also, they will try to find an entertainer who is in your area, saving you even more money, and getting the entertainer another show, making everybody happy! At Becwar & Associates Entertainment Agency the staff is friendly and helpful, working with you every step of the way. Not only do they help you choose the perfect entertainer, they can help with Advertising (Posters and Tickets), Production (Sound, Lighting, Set-up, and even Venue Ideas), and Hotel and Travel arrangements. Also, both the Becwar & Associates Agent, as well as the Entertainer will call you a few days before the show to go over the contract, and answer any last minute questions. Having the entertainer talk to the client directly puts the event planner at ease. By choosing Becwar & Associates Entertainment Agency, you are assured that your event will be a total success! If they don’t have something for you, they will help you find the right people that do. Whether it’s a corporate function, private celebration, or a public venue – they will help you find entertainers for any event. The Entertainment/Talent Agency that knows how to Entertain. We are entertainers. We know entertainment and talent from both sides of the industry – understanding the wants and needs of both consumer and performer.